Leon walked back and fourth. The last thing he saw was fighting 1000 heartless then all a sudden he black out and awoke here. 'Where is this place.' He thought as he looked down at his own footsteps he made by walking back and fourth. He looked up from the footprints in the sand as he turned his head at the ocean. "I don’t remember this place..." He said to himself. "It's no where in Kingdom Hearts, and I don’t remember this place in my own home world. So the best guess would be that I somehow ended up inside another world." He looked away from the ocean and saw some familiar designs carved into a rock face? "Hey...I recognize that….what’s her name told me about her world and things about it....her name was..." He thought for a second. "Yuna...that’s right...Yuna Rikku and Paine where treasure hunters, and they where quite energetic except for the crimson eyed one who was pretty much quiet for the entire conversation. " 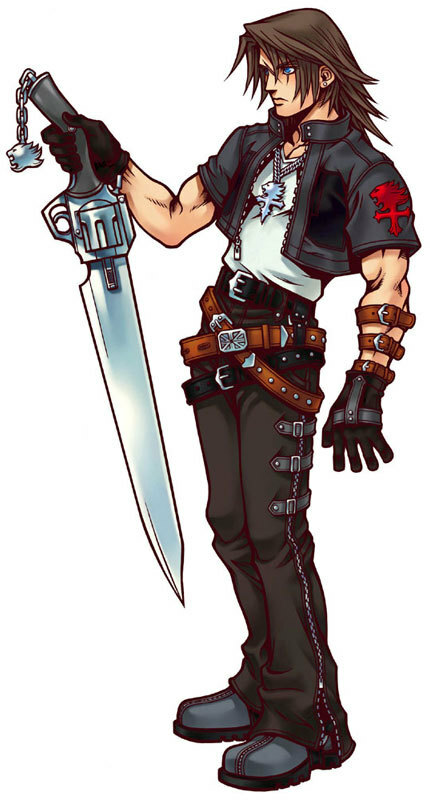 Leon remembered while he was out training and dispatching a few heartless he came across the three being attacked by a heartless he easily took it out and in return became friends as they would put it with him. He still not sure if he considers them friends but they did give him a gift and told him about their own world called Spira. He still has that sea shell bracelet inside his pocket for some reason or another. Yuna gave it to him, it has a verity of colors and even Leon couldn’t deny it's beauty. Rikku thought him how to speak, read and write Al Bhed while he and Paine traded a few sword moves from one another. Despite himself Leon cracked a small smile like grin as he read the Al Bhed on the rock face and said. Welcome to Besaid Island. "Besaid...that’s Yuna's village...hmm...I suppose this will be the best place to start my search back to Kingdom hearts." He nodded to himself as he looked around. "Now...how do I get to the village?" He muttered and sighed. Tidus walked along the old road, kicking up the dust as he went by, all he could think of was why Sin was attacking everyone n if it he could stop him. He stopped immediately and a thought came into his head, " i know, i gotta get an ultimate weapon and take him down." Leon turned his head as he heard someone speak supposely to him. "The names Leon...Leon Lionheart...." He said as he turned his body comepletely to face the blond boy that looked to be in his mid teens. 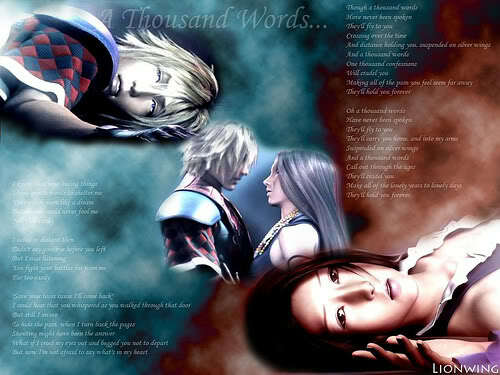 "And you are..." Leon said giveing Tidus his normal stotic face clearly saying 'Why the hell are you talking to me?' And also saying 'Leave me the hell alone...' Leon wasint sure which showed more sense no one ever had the guts to talk to him again after resiveing Leons Famous 'Drop Dead' Glare of Death. "Fascinating" Leon sarcastically said as he turned on the heels of his boots and started walking though the beach and toward the direction of the forest. He didn’t care about this boy, he doubt he could be any help in his search so he just didn’t ask him simple as that, well at least in Leon’s mind it was. But he had to admit he did envy him for having that innocence that was taken from him so early in his childhood. Leon shock those thoughts away and kept walking forming new prints in the golden sand with his black boots grinding against it getting some sand slightly into them as he walked. The whisper of the wind gently blew through the girl's chocolate brown hair, her fingers gripped into the sand as the small waves washed onto shore. She was sitting alone on the beach, thinking about what had happened, with Sin and all her friends. The girl named Yuna smiled slightly, today she wore her gunner's outfit, the dual machina pistols were placed either side of her hips in their holsters. Today was a good day. Leon continued walking gripping his large gunblade case with the griever logo on it. His heavy boots sunk into the ground like quicksand and had to use twice the work to raise his leg from the sand. "This is ridiculous..." He muttered as he stopped walking as he sunk into the sand a few inches. He sighed as he shoved his gunblade case into the ground and leaned against it with his arm propped on it as it stood straight up. Leon took off his black leather jacket and draped it over the case also as his eyes scanned the area. The beach looked quite boring and uneventful until his eyes rested on a familiar brunette and yelled. "Yuna!!" The wind and waves crashing against the beach seemed to drown out his voice as he sighed and yelled louder. "Yuna!!!" He almost screamed as his voice bounced off the rock walls and echoed throughout the island. *Oh well...* she thought, standing up and preparing to leave. Leon sighed as he trudged though the sand to yuna griping his black gunblade case. The heat seemed to slow him down slightly but he kept moveing until he reached yuna. He stopped in front of her as he set is case down on the ground as he looked down at the small brunette. 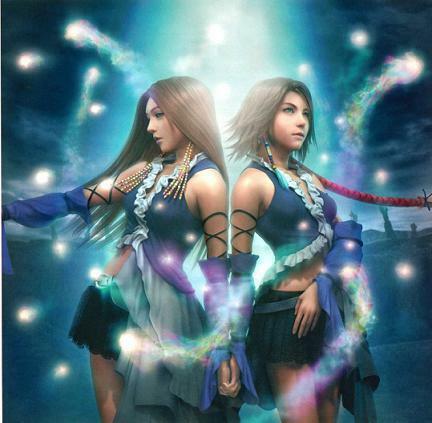 "Nice seeing your again....yuna..you do remeber me dont you?" He asked hopeing that she remebered him if only to ignore introductions again. "Umm..." she said, wondering who the man was. But then, it all came back to her, Hollow Bastion.. meeting everyone there... everything. "LEON!" she yelled as she ran forwards and grabbed him tightly, "How you been tough guy?" Leon had gotten much better with people over the years but still this is a bit much. He stumbled back a few feet before he regained his balance. "Uhh...good yuna..." He said still in shock as he patted her on the head and somewhat returning what he thought was a hug. 'It must be a custom or something to hug people so.....tight.' Leon thought as he wiggled around slightly but giveing up when he noticed that the young girls girp was to tight for him to break out of withour harming her. Yuna put on a cheesey smile as she let go of the man. "I'm not embarassing you... am I?" she kept her smile on as she walked away from him anbd turned back to face him. *Maybe I have amnesia or something! * she thought to herself. Leon winced at y'know. "Please dont say that ive had enough of that word for an entire lifetime." Leon remebered when he was still in his world and a certain black man named rejjin would say that after EVERY sentance it would bug leon so much he vowed to never say the word again. "Hmm....not at all yuna...it's nice to see you" Leon even cracked a small smile. Subject: Re: A new world.